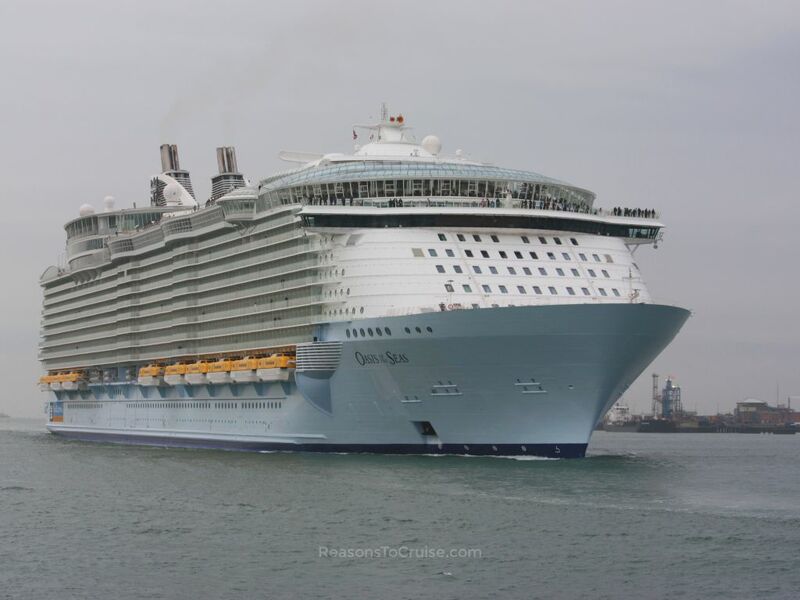 Reasons To Cruise > Cruise Blog > Cruise News > You Won’t Believe the Size of the Food Order for Oasis of the Seas! The world's largest cruise ships can each carry up to 8,700 passengers and crew. Once everyone is aboard Oasis of the Seas and Allure of the Seas, they need feeding. The figures below come from a National Geographic Adventure television programme entitled "Mega Food: The World's Biggest Cruise Ship". A film crew went behind-the-scenes aboard Oasis of the Seas to explore the culinary side of cruising that guests rarely see. The headline figures are simply staggering. On a typical week-long cruise voyage up to 200,000 meals are produced, averaging around 28,000 to 30,000 meals per day! 250 chefs across 24 nationalities work behind the scenes to transform 100 tonnes of raw ingredients into gourmet meals at sea in a 24-hour operation. Cooking starts long before passengers embark and the ship sets sail. Chefs prepare breakfast for disembarking passengers before making lunch and dinner for a fresh batch of cruise passengers. At the moment Oasis of the Seas is home-ported in Port Everglades, Florida, sailing on seven-night cruises to Nassau, Bahamas; St Thomas, Virgin Islands; and St Maarten, Netherlands Antilles. Every Saturday is turnaround day - the day the bulk of the stocks are replenished. In just nine hours workers load on enough supplies to last a week. With 21 food storage rooms, there is just about enough space to squeeze it all in. Military precision kicks in on turnaround day with an army of workers beavering away to get everything loaded in time for the sail-away deadline. The list above is for just one week and only scratches the surface of the total volume of stock ordered to keep the cruise ship running. Operating a cruise ship is a unique task. It is not as easy as ordering a pint of milk for delivery on a whim. Fruit and vegetables, in particular, need to be loaded at various stages of ripeness so that some of the produce can be consumed straight away while the remainder can ripen a few days into the voyage. Bananas, notorious for giving off ethylene gas that expedites the ripening of other fruits and vegetables, have to be stored separately. Over-ripe bananas are used in drinks and recipes, yellow bananas are offered to guests while green bananas remain in storage to ripen further. Quality produce is key to running a successful operation as inferior food can quickly spoil and cause shortages onboard. This is something cruise passengers tend to notice very quickly and can, in some instances, impact on guest satisfaction. You would be surprised to discover just how many complaints stem from a shortage of foodstuffs onboard. Around a two-day surplus of key basic ingredients is kept onboard in case the ship is unable to dock back in Port Everglades on turnaround day as per the itinerary. The hard work really begins once everything is on board and the ship departs Fort Lauderdale. Passengers quickly descend on the 24 food outlets. There are three key preparation areas on the ship - a butcher shop, a fruit and vegetable shop, and seafood shop. Each of these prepares all the raw ingredients ready for the chefs to cook with in one of 23 galleys or kitchens. All the food needs to be sanitised in the preparation areas before it heads out to the kitchens to ensure cleanliness. The main pantry acts as a wholesaler, equipping trolleys to supply each restaurant on demand with freshly prepared ingredients. The butchers prepare all the cuts of meat as well as all the burgers for consumption onboard. 6oz burgers are made for the dining room while 5oz burgers are made for Johnny Rockets. On Lobster Night, the butcher shop transforms into a field kitchen to handle the preparation of 4,000 lobster tails. Lobsters first need to be defrosted; then they are butterflied before a coat of butter and seasoning sauce is applied. Between 70 to 80 lobsters are cooked at a time in a steam oven for eight minutes. A central bakery prepares and bakes all the bread, rolls, and pastries consumed onboard. The exception are burger rolls which are pre-prepared. For tedious tasks such as chopping lettuce, a machine is used. Lettuces are cut, washed, and spun in an industrial centrifugal salad spinner to dry. Not only does this avoid soggy salads but it also helps to keep the lettuce fresher for longer. Main dining room meals cook in batches on set lines. Each chef on the line has a list of responsibilities. Many chefs may work on individual elements on each plate. As with land-based businesses, each of the food preparation areas, kitchens, and galleys are inspected daily to ensure cleanliness, tidiness, 'best before'/'use by' dates are honoured, and to ensure that the correct storage conditions are being maintained. The high-pressure environment intensifies on sea days and days with short port calls. More people onboard equates to more mouths to feed. The one thing the figures above do not reveal is the quantity of food waste generated onboard. You only need to spend a few minutes in the Windjammer Buffet to see some people laden their plates with towers of food only to leave some of it to go to waste. Add onto that the scrap food wastage (meat bones, meat fat, vegetable peelings, etc.) and I bet that equates to equally astounding figures. Have you sailed on an Oasis-class ship? Does the amount of food and drink required for a sailing surprise you? Share your thoughts in the comments below. 10 July 2015 6 February 2018 You Won’t Believe the Size of the Food Order for Oasis of the Seas! I had gone to several cruises. I had lobster dinner one night, and the waiter asked if I wanted another one. I said yes, I told him to bring just the lobster but he brought another plate with lobster and vegetables. I could only ate the lobster and the rest was discarded. I would estimated that 30%+ food were wasted. I tried looking for figures but couldn’t find reliable stats on wastage, and cruise lines aren’t particularly forthcoming on such data either. My guess from my own observations is the wastage rate is pretty high, which could explain why cruise lines are beginning to charge for things like room service. By reducing unnecessary waste, it reduces the cruise line’s costs and also the environmental impact.